What is Lifespan Religious Education? Lifespan Religious Education (LRE) is for everyone! It includes Adult Religious Education (ARE), Youth Religious Education (YRE), and teen and young adult programs. As believers in a faith that values the free and responsible search for truth and meaning, we engage in religious education all the time. It is essential to who we are as Unitarian Universalists. We invite you to read on and learn more about religious education at MVUUF. Please review our Sunday schedule and our information for visitors as you plan your visit. 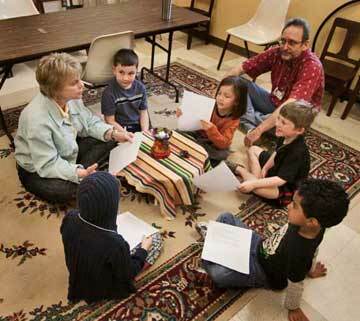 At MVUUF, Youth Religious Education (YRE) includes regular Sunday classes as well as periodic “extras” such as Our Whole Lives (OWL) comprehensive sexuality education classes and classes that help children and youth explore their personal faith formation. YRE also hosts fun special events throughout the year like a Halloween celebration, Holiday craft-making afternoon, and an Easter Egg hunt. Stay up to date with announcements about upcoming classes, special events, and more by learning how to stay connected to YRE. All children and youth attending YRE classes must register. Visitors may use the guest registration form; however, after three visits, please complete the full registration form. Both registration forms are available online and at the Fellowship. Registration helps us learn names, track attendance, plan for activities, and accommodate any special needs. Adult religious education classes provide an opportunity to read, think, and talk about personal faith formation with other adults in a diverse setting. – Build Your Own Theology – A 12-week workshop created by Rev. Richard Gilbert that examines the roots of personal theology, this class includes discussions of human nature, ultimate reality, the history of Unitarian Universalism, ethics, and creating meaning in our lives. – New UU – This seven-week curriculum created by the Unitarian Universalist Association looks at UU history, principles, worship, community, theology, and membership. – Compassionate Communication – Based on Marshall Rosenberg’s book Nonviolent Communication, this 10-12-week course offers discussion and practice of the methodology of observation, feelings, needs, and requests. Did you know that all of our religious education classes are taught by dedicated teams of volunteer teachers from our congregation? Volunteers also plan and coordinate our special events throughout the year. If you’ve enjoyed the classes and events that you and your family attend at the Fellowship, please consider volunteering! In addition to the Director of Religious Education and Assistant Director of Religious Education, the Youth Religious Education Committee and Adult Religious Education Committee help coordinate and plan classes and special events through the year. Committee members serve two-year terms and meet monthly.